I love faeries, I really do. But this one just didn’t cut it for me. Marr’s writing was wonderful, very poetic and lilting, but she switched between too many points of views. I personally think anything more than three is way too many, and she had several. It detracted from the overall reading experience. The entire time I was too busy keeping track of all the different perspectives. I did like the various types of fey that Marr introduced to us. They were described well, and were intriguing. I really liked the whole schtick with the Summer King, and those who weren’t the Summer Queen became Winter Girls. Speaking of Winter Girls, Donia, the current one, was actually my favorite character in the whole book. Aislinn, the main character, doesn’t do anything. Honestly, she spends most of her time sleeping. She can’t make a decision on anything, and because of this, the plot suffered.The entire novel moved very slowly, and when it did move, it wasn’t because of Aislinn, it was because of the other characters. Mostly Donia. She was actually a major driving force in this novel, and if Marr had wanted to, Donia could have actually been the main character. Beira, the villainess of the novel, was just some Disney movie reject. Seriously, I was at no point in the novel intimidated by her. She reminded me of the evil queen from Snow White, and Ursula from The Little Mermaid. Seth, Aislinn’s main love interest and best friend, was… well, perfect. In a bad way. In the Edward Cullen way. Where are his flaws? Problems? He’s just there, and perfect. And to provide some angst. Honestly, I expected so much more from this book. There was SO MUCH potential, but it fell flat. 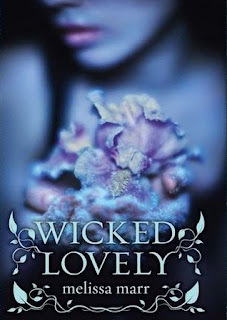 BUT, I will give Melissa Marr the benefit of the doubt, so I will most likely be picking up her next few novels. My favorite part of the whole book is the cover. Isn’t it just gorgeous?